Take this as a start towards accomplishing something amazing and download the social business model canvas. 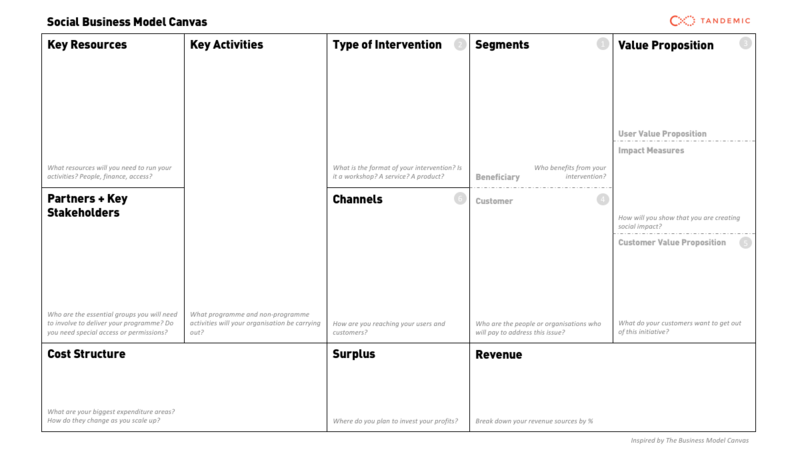 You can download an image version of the social business model canvas right now, or drop us your email and we’ll send you a high-resolution PDF version. Get a high-resolution version of the canvas in your inbox. NEED AN EXAMPLE? WE'VE GOT YOU COVERED. The Social Business Model Canvas is a tool for creating a solid business model around your social enterprise. It’s also a collaborative tool that helps you communicate different business models with your stakeholders and brainstorm new ones. Social Business Model Canvas is brought to you by Tandemic, an Asia-based innovation firm. We work with businesses, governments, and social organizations to solve tough problems, find new growth opportunities, and build in-house capacity to innovate.